Virgin Records is suing 30 Seconds To Mars for $30,000,000 for breach of contract and damages. According to paperwork filed Friday in Los Angeles Superior Court, Virgin accuses 30 Seconds members Jared and Shannon Leto of not delivering three of five albums under the band’s contract, which it entered in 1999 with Immortal Records. Virgin took over the contract in 2004. A rep for the band told TMZ however that 30 Seconds To Mars has not been paid accordingly for the their last album, A Beautiful Lie. 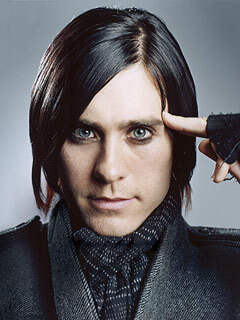 According to frontman Jared Leto, the band is currently working on a follow-up to A Beautiful Lie in Los Angeles. It’s spelled “know”. But I welcome the debate about Jared. Anyone else want to weigh in?